Hey Party People! 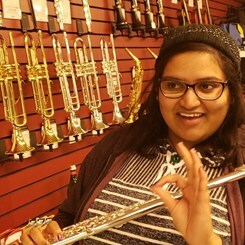 My name is Shruthi and I have been playing flute since 2006! I knew I wanted to play since I was 5 years old and after years of waiting my dream came true and I got my first and only flute from Music and Arts! I remember how excited I was to finally get to hold it and see myself actually playing. I played through middle and high school and have experienced both concert band and marching band. I have always loved music! My family is very musical. My mother and father both listen and play to classic Bollywood songs. My dad plays percussion like tublas and my mom sings her heart out! My older brother plays the saxophone and was so good in fact he went on to state champion for Washington. I feel so lucky to have this opportunity to work for Music and Arts. I started as an Ed Rep for the Olympia district and have gotten to see many schools and children engage with instruments. When a first time student comes up to get an instrument and you get to see them hold and really experience one for the first time is such an honor. I see the same excitement in them as I had. I also get to work with the coolest people who love music and I get to grow and become more knowledgeable about music every day. Please come see us so we can answer any questions and make your dreams come true!! !